Everything went well, only negative thing was when the restaurant manager was shouting at the lady that was taking care of the breakfat, that was unpleasant and seemed not to be justified ! One night business stop over. We were pleasantly surprised by the quality of the hotel. The room was clean and pleasant and the food was unusually good. The service was prompt and efficient. We would repeat the experience. This is a lovely luxurious hotel with excellent facilities. It has a nice pool area with comfortable loungers and provides towels at the poolside. The views are lovely and the restaurant and bar are good. The staff are lovely, make you feel very welcome. We were there for three nights and could have stayed longer! This is a hotel in the heart of the countryside but still fairly easy to access from the motorway. The rooms are spread around the complex and not within the main building so this does mean walking to breakfast and dinner which is fine in good weather. There is a lovely pool area with comfortable loungers. The restaurant is lovely with views over the golf course and the bar has a nice terrace. The staff were lovely and welcoming. 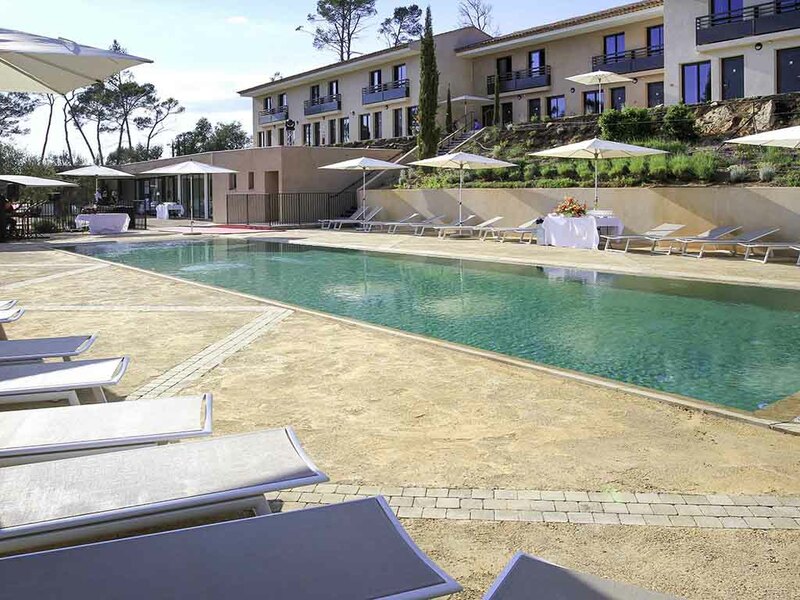 Nice and calm place to spend one night on the way to Nice or if you are passionate about Golf. Super breakfast for 3* hotel. Dinner in the restaurant also good. Excellent value for the price paid. The rooms are spacious and clean. The resort is very nice, with big pool and extremly big rooms, some with the balcony. The staff is very friendlu and helpful. Good breakfast. Extremly recommended. Rooms and equipments OK, booking and check-in/out ok, nice pool, beautiful location, but staff not very friendly, did not feel warmfully welcome, restaurant staff seemed newbies or inexperienced. No pool bar. We thoroughly enjoyed staying with you.The staff were all very helpful and courteous and the food excellent. The room was very comfortable with plenty of hanging space but no drawers in which to put smaller items of clothing. No functioning irons. We were there for a wedding and only two irons available for the whole hotel. The one we received did not function. Basics of hotel management suggest every room should have a functioning iron. Lighting in my room was not functioning either. No apology or acknowledgement of it of any kind. Otherwise the place was clean and relatively comfortable. We arrived late at night by taxi with two small children and quite a lot of luggage and there was no luggage trolley or anyone to assist with taking luggage to the room. I was asked my name and handed a key. There was no pleasantries that I'd expect arriving at a reputable hotel - e.g. 'welcome' / 'enjoy your visit' etc. The person on reception just pointed to where the room was. Luckily the taxi driver hadn't left at that point and was able to help us pack our luggage back into the taxi and take us to our room. The bedroom was infested with ants. The pool area did not have adequate towels or loungers / chairs. The breakfast was nice and staff were generally helpful when approached. Didn’t live up to expectations and very expensive. Got off to a bad start because no-one at reception answered our call requesting access through the security gate. Eventually, after 20 minutes an outgoing vehicle let us in. I know this was the same for other late arrivals. There was more often no-one on Réception than there was someone. We were disappointed at the standard of rooms considering the price. We booked lunch for 12.30, but it was almost 1.30 when our Oder arrived- after several requests because we had to prepare and go to a wedding. As our food was only sandwiches and a salad, we thought it was a bit ridiculous to have to wait that long. This was a chance find looking for a nice rest stop in this general area. We WILL be back for longer next time! We arrived and staff weren’t very helpful, the restaurant food was awful but staff didn’t understand us enough to explain how bad it was. My room has ants everywhere including my bed (I have photos to prove it). It was obvious they had sprayed the room before we arrived as the dead ants were still there when we checked in! We had a 4 month old baby with us and I was worried they were all over him while he slept. I think we paid way too much for the meal and the room. The stay was very nice, the room was clean and the facilities and breakfast were very good. The staff were all very friendly and helpful and accommodating of any requests made by our group. The only negative aspects related to the housekeeping side. We paid for a Premium room but our coffee machine, mini bar and waters were never replenished in during the three nights that we stayed. There was also a lack of towels provided by the pool.